Evetything was just perfect! 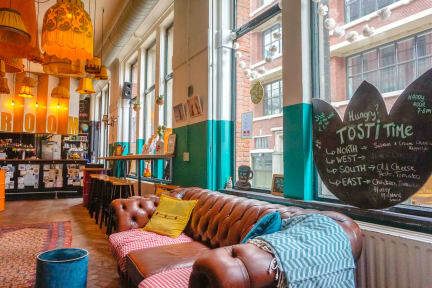 I am sure if i will go to Rotterdam, i will choose this hostel again. What i liked the most is that the hostel offered some programmes. For example free city tour, pasta night. 5 million stars!!!!! I want to live here! I’m still sad I had to leave and head north to continue my travels bc Rotterdam rules and this is the best hostel I’ve ever been to! If you’re coming to Rotterdam, STAY HERE no questions asked! The shared room was Gorgeous and large with an amazing view (& big table) and the staff is SO_NICE and cool! Breakfast is great and the common area is warm and well-designed. Location is fire, info so easily available, just remember to rly close ur shower curtain! I really enjoyed staying at this hostel. The second I turned up the lady at the counter was so friendly and gave me a map and a bunch of things to do while I was waiting to check in. The room was nice and big and the beds had individual lights. They have a bar in the hostel which made for a very good vibe. As a solo traveller it made it easy to meet people they also have games. The hostel has things on most nights like Dutch Delight night and walking tour. For one more time in this hostel, this time with my friends. This hostel is great! First and foremost it's clean and the staff is very friendly and ready to help you with everything. It has a simple but fulfilling breakfast and you're ready to seize the day! Totally recommend it. We booked a basic double room ensuite. The staff were helpful and nice, simple breakfast. They even put a welcoming chocolate and postcard in the room to welcome us, very sweet. They helped us to check out early and got a simple breakfast for us. However, the only bad thing is, whenever anyone walk pass the floor or the stair, the wooden floor crack and the door bang rather loudly. other than this, its pretty ok!